Several recent studies highlight the heightened risks of increased Arctic shipping, along with some opportunities to minimize the effects of shipping noise on specific Arctic species and populations. With the retreat of sea ice, both the Northwest Passage (along Canada’s northern coast) and the Northern Sea Route (along Russia’s northern coast) are seeing increases in commercial and fishing vessel traffic. While the first cruise ship crossed the Northwest Passage in 2016, Russia’s Northern Sea Route is the current center of activity, with both container ships and LNG (natural gas) tankers making pioneering transits without icebreakers over the past two summers. Total ship numbers are still modest, as it’s not yet cheaper than the longer route through the Suez canal, but these test runs are explicitly intended to chart the course for rapid increases in the coming years; Russia aims to ship 80 million tons of cargo by 2024, up from 10 million tons in 2017 and 2018, and China is moving rapidly to implement a “Polar Silk Road” initiative to encourage companies to build the infrastructure necessary to ramp up this shortcut to European markets. In addition to narwhals, beluga and bowhead whales and some subpopulations of walrus are likely to be vulnerable to increased noise; ringed and bearded seals, as well as polar bears, will be less vulnerable, thanks to widespread populations and spending much of the summer on land rather than in the water. 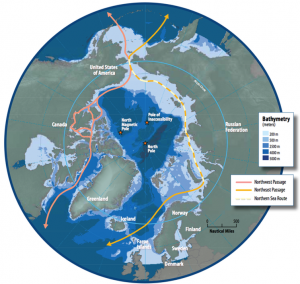 In addition, the researchers stressed that the Bering Strait is a key chokepoint for both Arctic sea routes, as well as being a crucial migratory corridor. Under quiet conditions, beluga whales experienced a 50 percent listening space loss when they were 7 to 14 kilometers (4.3 to 8.7 miles) away from a ship traveling at 25 knots. When ships slowed to 15 knots, whales could get as close as 2 to 4 kilometers before they experienced the same loss of listening space. In other words, when a ship was going faster, the area over which it cut a beluga’s listening space in half might be more than three times larger. This difference is important because there are many places where whales cannot distance themselves from ships in the Arctic (in the narrow Prince of Wales Strait, animals can maintain a maximum distance of just 7 to 10 kilometers). As always, the results are not all as simple as that; the researchers found that for some species, the effects are less in certain weather conditions or for different kinds of ships (container vs. cruise), and that in some situations, the effects can actually cover a larger area when ambient noise is high (as it increasingly is with loss of ice cover). And, as always with vessel-slowing programs, planners must consider the tradeoffs between moderating the noise level and increasing the time during which ships are audible during slower passages. With the inevitable increase in Arctic shipping, it will be crucial for both governmental and commercial players take steps to minimize the acoustic impacts in these remote waters, among the last areas in the seas where human noise intrusions have been relatively modest. After 100 years away, whales rediscover New Zealand, where they used to be the noise nuisance! Ironically, considering the growing concern over the impacts of human noise on whales worldwide, early settlers in Wellington complained that whales in the harbor there kept them awake at night! How the times have changed…. You may have noticed a recent flurry of press reports about research in Hawaii that begins to quantify a long-suspected quality of cetacean hearing: the ability to dampen hearing sensitivity so that loud sounds don’t cause damage. 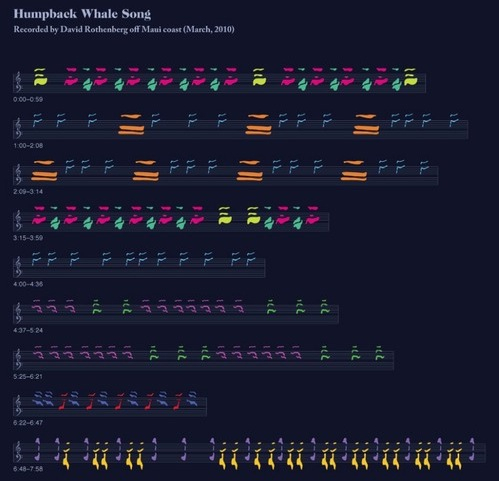 Given the extremely loud volume of many whale calls, which are meant to be heard tens or hundreds of miles away, researchers have long speculated that animals may have ways of protecting their ears from calls made by themselves or nearby whales, perhaps using a muscle response to reduce their hearing sensitivity (not unlike a similar muscular dampening mechanism in humans). Indeed, earlier studies by Paul Nachtigall’s team had found that some whales could do indeed reduce their auditory response to the sharp clicks they use for echolocation. In the new study, Nachtigall trained a captive false killer whale named Kina to reduce her hearing sensitivity by repeatedly playing a soft trigger sound followed by a loud sound. Eventually, she learned to prepare for the loud sound in advance by reducing her hearing sensitivity. “It’s equivalent to plugging your ears…it’s like a volume control,” according to Nachtigall. Oops, they did it again! Grab some interesting new science and leap to apply a specific finding to a broad public policy question, often, as this time, giving us a false sense of security that the “experts” have solved the problem, so there’s no need to worry our little selves over it any more (as stressed in this NRDC commentary). To be fair, the Times piece included a few cautionary comments from both scientists and environmental groups, but the headline rippled across the web as the story was picked up by others. Two key things to keep in mind: First, this whale was trained to implement her native ability, meant for use with her sounds or those of nearby compatriots, and to apply it to an outside sound made by humans. This doesn’t mean that untrained whales will do the same. And second: If whales can dampen their hearing once a loud sound enters their soundscape, this could indeed help reduce the physiological impact of some loud human sounds, such as air guns or navy sonar. If indeed this ability translates to wild cetaceans, the best we could hope for is that it would minimize hearing damage caused by occasional and unexpected loud, close sounds that repeat. There would be no protection from the first blast or two, but perhaps some protection from succeeding ones; or, if the sound source was gradually approaching or “ramping up,” as often done with sonar and air guns, animals may be able to “plug their ears” before sounds reach damaging levels, if for some reason they can’t move away. Even then, the animals are very likely to experience rapidly elevated stress levels, as they would be less able to hear whatever fainter sounds they had been attending to before the intrusion. Yet research in the field suggests that most species of whales and dolphins prefer to keep some distance from such loud noise sources; this hearing-protection trick doesn’t seem to make them happy to hang around loud human sounds. Most crucially, these occasional loud sounds are but a small proportion of the human noises whales are trying to cope with. Noise from shipping, oil and gas production activities, offshore construction, and more distant moderate sounds of air guns all fill the ocean with sound, reducing whales’ communication range and listening area, and likely increasing stress levels because of these reductions. This is the “din” of chronic moderate human noise in the sea, and Kina’s ability would not help her cope with any of it. We’re a long way from being able to rest easy about our sonic impacts in the oceans. Peter Madsen, a professor of marine biology at Aarhus University in Denmark, said he applauded the Hawaiian team for its “elegant study” and the promise of innovative ways of “getting at some of the noise problems.” But he cautioned against letting the discovery slow global efforts to reduce the oceanic roar, which would aid the beleaguered sea mammals more directly. Jump on over to Scientific American to read this great overview of the many different ways that animals are using to adapt to increasing human noise in their habitats. The author is an NYU science reporting student, and she promises a new sound blog soon on Scienceline…. Paul Spong and Helena Symonds are legends in the field of whale research; since the early 1970’s they’ve dedicated themselves to studying orcas from their independent lab on an island between Vancouver Island and the mainland. 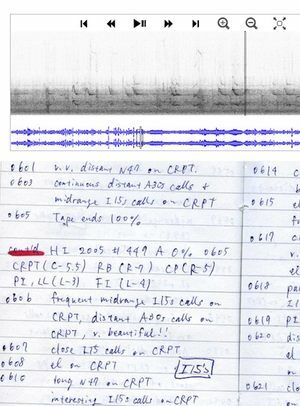 Over those many years, they’ve accumulated 20,000 hours of tapes, which are now being digitized and cleaned up (to remove hiss and other noise and make the orca calls more prominent) by George Tzanetakis of the University of Victoria. A recent article in the Toronto Globe and Mail focuses on Tzanetakis’ work, which is being posted online for researchers and curious listeners as the Orchive. The entire collection isn’t online yet, but there’s plenty! A key research paper from National Park Service and Colorado State scientists has been published in Trends in Ecology and Evolution. The paper, which got a lot of press when it was first made available online in the fall, introduces two key new metrics for measuring the effects of noise on animals. The first, “alerting distance,” is the distance at which sounds can be heard: these may be sounds made by a species to alert others to danger, or sounds made by predators (which prey animals want to hear, so as to take cover). The second, is “listening area,” the full area around an animal in which it can hear other animals’ calls, footsteps, and wingbeats. A key insight offered by this approach is that even moderate increases in background noise (from nearby roads, airplanes, or wind farms) can drastically reduce an animal’s listening area. The paper, which was free while in pre-press, is now available only to subscribers to the journal or other academic journal services; an article published in Park Science magazine and free to view online introduces much of the same material (be sure to click on the links to the figures, as they illustrate the concepts very well): see the article here, and check out the entire special soundscapes issue of Park Science here. “The male sage grouse, in its mating displays, produces high-frequency popping sounds and swishing sounds,” Fristrup said. “It also uses a low-pitch hooting sound, which carries the farthest from the display area as a long-distance advertisement. The danger is, it doesn’t take a lot of noise to substantially reduce the range at which females or other males could hear that low-frequency hoot. So the attraction radius of the display ground could contract substantially with the inability to hear a hoot.” The authors note that some species can reduce the effects of masking by shifting their vocalizations. This is especially true when members of a species are communicating with each other. However, when the sounds a species depends on emanate from another species (such as a mouse burrowing under the snow, which an owl needs to hear as it hunts), there is less room for compensation. Carnivores like lynx, who sit at the top of the food chain, can be particularly sensitive to habitat degradation of any type — including auditory — since each individual requires a huge hunting territory. “If one part of the range of a top-level predator is compromised, it may not take much to squeeze it out,” Fristrup said. Contrary to what one might expect, noise is not always more disruptive when it’s louder. Snowmobiles or cars, for example, might be less disruptive to elk or deer than a hiker or cross county skier would be. 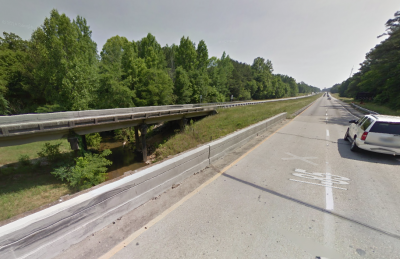 “There’s pretty good evidence that so-called quiet use can disturb wildlife. If it’s a noisy source, the animal perceives it a long way off and can track its progress. There are no surprises, and it can go on feeding or doing whatever else. A quiet sound, like a snowshoer’s footstep, is only perceptible when it is very close, potentially startling the animal,” Fristrup said. To read AEI’s detailed lay summary of the research paper, published here in December, see this link. In the most promising development yet in using acoustics to deal with the spread of bark beetles in the American and Canadian west, researchers at Northern Arizona University have found that some beetles can be disrupted by playback of other beetle sounds. The tiny insects make squeaking noises as they tunnel through trees; the researchers have been manipulating the beetle sounds, which are above human hearing, and playing them back to the insects. The results drive them buggy: They attack each other, scamper in circles rather than straight lines and have tried to gnaw their way through Plexiglas covering a cross section of a tree in a lab in Flagstaff, Ariz.
“One of the questions is if we could effectively remove them from a particular tree or set of trees, where do they go, what happens to them?” Stephens said. “I’m very excited to see what happens next” with the research. Hofstetter and McGuire are eager to run tests on the ground to answer questions like that. Working with Dunn, they have applied for a patent on a device that pumps in noise to throw off the beetles’ destructive course. Hofstetter said the sounds are at a frequency that shouldn’t bother other species. The work has been a side project for the professor, who has struggled to scrape together funding for the research. McGuire is volunteering his time. 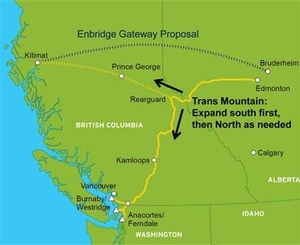 “We’re hoping it’s going to lead to a whole new field,” Hofstetter said. Dunn’s CD, The Sound of Light in Trees, was released by EarthEar; 100% of all sales revenues are donated by Dunn and EarthEar to support the Acoustic Ecology Institute. See more on the CD and beetle project on AEI’s website. I’ve just finished reading what must be the most exciting research paper I’ve seen this year, barely nudging out a similar paper addressing terrestrial noise impacts. A small group of researchers, with Chris Clark of Cornell as the lead author, took a giant step forward in addressing the impacts of ocean noise on the communication ranges of whales. They came up with a clear and strikingly rigorous set of new metrics that will allow researchers and ocean planners to have a much more practical picture of how numerous noise sources combine to create cumulative impacts on acoustic habitat. The new approach centers on the “Communication Space” of individual animals, as well as groups, and provides an intuitively obvious way to both imagine and assess the effects of ocean noise – measuring the area in which an animal can hear or be heard by others of its species. My formal “lay summary” of this paper is reprinted in full below the fold, and I encourage anyone with a deep interest in ocean noise to read through that five-paragraph overview, or to download the paper yourself. The key takeaway for those of you with a more casual interest in these issues is that in the test case that they used to illustrate their new approach, the researchers found that shipping noise has dramatically different impacts on different species, even though all three species they studied are low-frequency communicators. In the area off Boston Harbor that they investigated, the critically endangered right whale is by far the most affected by shipping noise: on a day when two ships passed through the area (the average is often six), right whale Communication Space was reduced by an average of 84% over the course of the day, with several hours in which they could hear and be heard in an area less then 10% of that which would be expected without shipping nearby. 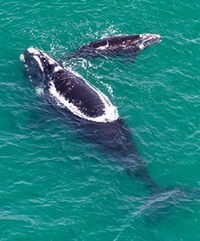 Since right whales call back and forth to find each other as they form groups for feeding, this is truly worrying (though the key question of how a reduced communication range actually affects animals remains unanswered). Fin whales and humpbacks were far less dramatically affected, with their Communication Spaces reduced by just 33% and 11% respectively. An ongoing research project from the National Park Service Natural Sounds Program is about to publish a groundbreaking paper that outlines the many ways that even moderate increases in human background noise can create major impacts on animals. 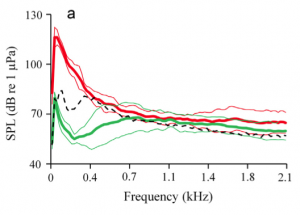 The study proposes a new metric for use in bioacoustics research, the “effective listening area.” This is the area over which animals can communicate with each other, or hear other animals’ calls or movements; as might be expected, animals focus especially on listening for sounds at the very edges of audibility, so that even a small increase in background noise (from a road, wind farm, or regular passing of airplanes) can drown out sounds that need to be heard. The authors note analyses of transportation noise impacts often assert that a 3dB increase in noise – a barely perceptual change – has “negligible” effects, whereas in fact this increased noise reduces the listening area of animals by 30%. A 10dB increase in background noise (likely within a few hundred meters of a road or wind farm, or as a private plane passes nearby) reduces listening area by 90%. See these and more at the AEI lay summaries of new research page. Additional Mitigation: Common Sense Precautions or Undermining Sailor Safety? There’s a fair dose of decoding science and regulatory details in this document, as well as acknowledgment of the underlying unspoken ethical questions that lead to radically different perspectives on the same data.